Also I have already reviewed them in Rose Gold, Golden Brown and and Intense Plum HERE. Packaging ~ Oriflame The One Color Impact Cream Eyeshadow comes in a pot jar with a purple screw cap. Its travel friendly and can be easily tossed in your handbag/makeup bag. It can be compared to Maybelline 24 Hour Color Tattoo as well. Finish ~ Cream to powder like texture – goes on creamy and transforms to a powder within few seconds. You need to work with it quickly. Texture ~ The eyeshadows have a creamy texture and glides on easily. You can apply it with your fingers or use a concealer brush to apply it on your lids and blend it with your fingers. Color and Pigmentation ~ Shimmering Steel is a pretty steel grey color. Can be used to create smokey eyes as well. I am not very fond of this color. I think its the least pigmented of the three and needs to be layered. This one also creases. Deep Indigo is an electric blue color with silver shimmer. I think it really compliments my brown eyes and is one of my favorite. Also its well pigmented. Olive Green is a pretty olive color with golden shimmer. I love the color and it compliments my eye color as well. Will compliment fairer people better. It is fairly pigmented. Stays for a long period of time without creasing, fading or using a primer. Bit pricey but Oriflame always has some offers going on. Only available through Oriflame representatives. Shimmering Steel creases a little. Overall, I am in love with these cream eyeshadows. They blends easily and there is no need of using a brush too. Comes handy while in hurry. 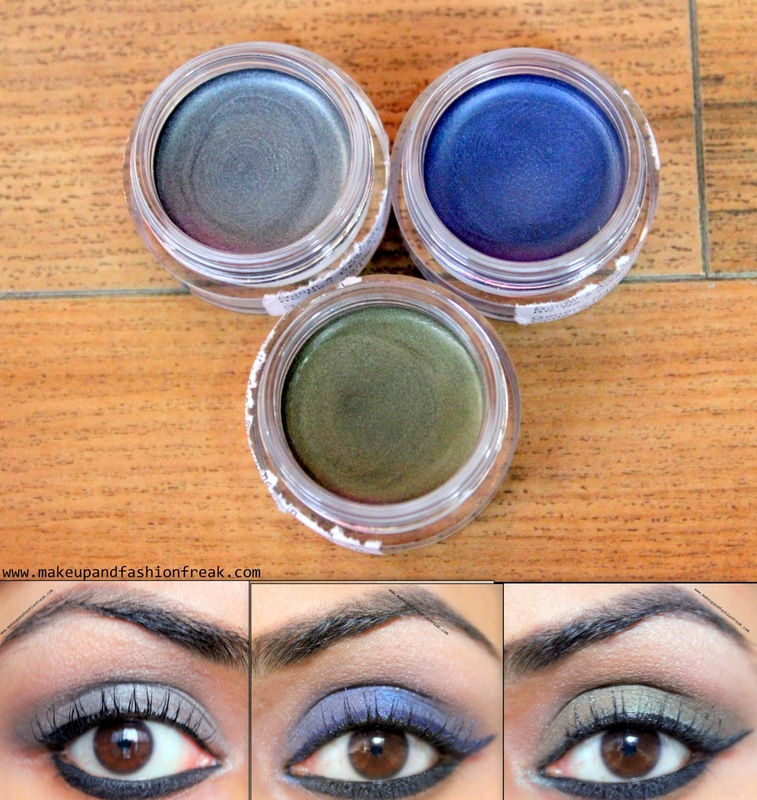 The eyeshadows can be used alone or can be used with other colors. P.S. Did you guys notice how the application of eyeliner can change the shape of eyes? ?